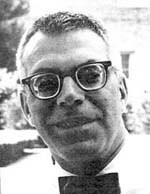 Leonard Jimmie Savage (he reserved "Leonard" for his publications) was probably the most extreme advocate of a Bayesian, or in his word, "personal," approach to probability questions that statistics has ever seen. Including Bayes himself, who left his theorem unpublished due to his own doubts about it. Savage was born in Detroit, where his early schooling was hampered by poor eyesight. His gift for mathematics was eventually detected. He graduated from the University of Michigan with a major in mathematics (1938), and completed his PhD three years later (1941). Unlike George Dantzig, he was not repelled by the theoretical character of Michigan mathematics. He spent 1941-1942 at the Institute for Advanced Study in Princeton, where he came under the eye of John von Neumann. After spells at Cornell and Brown, in 1944 he entered war work with the Statistical Research Group at Columbia. His young colleagues included statistician Fred Mosteller, who later became prominent in the Bayesian camp, and who wrote a joint paper with Savage while still at the Research Group. Also present, but in a position of authority, was economist Milton Friedman, who criticized Mosteller and Savage's paper, in the process teaching the two of them how to write (having learned that lesson, Savage would later write two joint papers with Friedman himself). This was the period when von Neumann was developing game theory, in close contact with econometric theory. His seminal work with Morgenstern, Theory of Games and Economic Behavior, came out in 1944. Savage's own thinking was evidently affected by that concept, and by the generally prevailing atmosphere, but it was his encounter with the work of Bruno de Finetti (on coherence theory, 1930) that fully showed him the Bayesian light in a mathematically doable form. "will consider $1 the fair insurance premium against a risk of $6 to which he might be exposed by occurrence of the Ace." That is how Bayesians say "one-sixth." We are here on the verge of a total restatement of expectation theory in Bayesian terms. Savage, moving in that direction, presently came to feel that not some problems, but all problems in statistics could be seen, or rather could only be validly seen, from the standpoint of personal or subjective probability. In 1947, Savage went to the University of Chicago. There followed a fertile period. Savage's personal version of personal probability had always had a pronounced econometric streak, and Chicago gave him much scope for its development. In 1948 appeared the first of his two papers with Friedman, on choices involving risk. In 1949 there followed a paper with Halmos on the sufficiency principle. In 1949, together with Allen Wallis, Savage founded the new Chicago statistics department. In 1952, he again collaborated with Friedman, this time on the expected utility hypothesis, a concept which had first appeared in the 1944 work of von Neumann and Morgenstern. His 1954 book Foundations of Statistics, a thoroughgoing indictment of the sloppiness of traditional statistics, and an axiomatic rethinking of the field on Bayesian postulates, was a major and very influential pronunciamento of that creed. It developed the theory of utility which had first appeared in von Neumann and Morgenstern. His econometric emphasis continued to be seen in a 1955 paper with Lorrie, on managing capital. "I am here to enlist your active participation in a movement with practical implications for statistical theory and applications at all levels, from the most elementary classroom to the most sophisticated research. Personal contact with so many competent and active statisticians in connection with issues that still seem liable to emotional misinterpretation when merely written is very auspicious. Nor could one possibly arrange better to stimulate and hear the criticisms and doubts that the subjectivistic contribution to statistics must answer." "In his development of personal probability, Savage moved more and more to a proselytizing position. Personal probability was not only useful and interesting to study; it became for him the only sensible approach to probability and statistics. Thus, orthodoxy of neoradicalism developed: if one were not in substantial agreement with him, one was inimical, or stupid, or at the least inattentive to an important scientific development. This attitude, no doubt sharpened by personal difficulties and by the mordant rhetoric of some anti-Bayesians, exacerbated relationships between Jimmie Savage and many old professional friends. The problem had a special poignancy for those who, like myself, took an eclectic point of view." In 1964 he moved again, to a named professorship at Yale, and apparently to a greater degree of personal tranquility. Bayesians reject intrinsic probabilities (the idea that the probability lies in the object). But their notion of experiential probability has to begin somewhere. This "somewhere" condition is arrived at by assigning "prior probabilities," an initial likelihood that later experience will revise. But for Bayesians, the initial probalities can't be taken from the object, they must also lie with the subjective self, which has, by definition, in advance of experience, no clue as to what they are. To Bayesians, all assumptions about future events is more or less risky. Gambling thus becomes their paradigm of decision making; a gambling scenario underlies de Finetti's comment above. Savage pursued the gambling paradigm with his usual theoretical thoroughness. In 1965 appeared his book with Lester Dubins: How To Gamble If You Must. Gambling was a hot topic in the period generally. Mosteller's paper on long runs in dice throwing, written in collaboration with an obsessive dice thrower, appeared in 1971. "Mosteller began work on the model in 1949, when psychology was ruled by behaviorism: the study of performance and its change through direct observation. This was also a time of great optimism for the use of mathematical models in the social sciences. Scores of researchers joined the bandwagon, making learning theory of the 1950s and 1960's a very active research area. Then, almost as suddenly as it began, work in mathematical learning slowed to a trickle. This occurred so abruptly that young mathematical psychologists who emerged at that time report feelings of confusion and shock." "Within the field itself, although a number of different models could successfully predict the proportion of correct guesses over time averaged over subjects, none had great success at matching a single subject's sequential behavior. Upon closer inspection, details of the model's account of probability learning turned out to be wrong. The interplay between mathematics and experiment forced psychologists to recognize that overall learning was far more complex than the sum of many simple processes." "An important force from outside learning theory that contributed to the end was the sweeping shift from operationalism to cognitive psychology. In the operational paradigm, talk of "the mind" was banned. The cognitive paradigm brought new kinds of questions, a shift in interest from learning to memory, and a distrust of old tools such as mathematical modeling. Game theory stopped dead in its tracks about the same time as mathematical learning theory. Without the support of psychologists, other theorists withdrew, and work in the field was terminated." "The original aim of the second part of the book, beginning with Chapter 8, is all too plainly stated in the second complete paragraph on page 4. There, a personalistic justification is promised for the popular body of devices developed by the enthusiastically frequentistic schools that then occupied almost the whole statistical scene, and still dominate it, though less completely. The second part of the book is indeed devoted to personalistic discussion of frequentistic devices, but for one after another it reluctantly admits that justification has not been found." It might be said that as the star of game theory declined, so did Jimmie Savage himself. He died toward the end of 1971. Mosteller, less invested in that particular approach, is still alive at the present writing (2003). "I personally benefited enormously from my close association with Jimmie right at the beginning of my career. I learned how to get started and to get out of ruts. I benefited too, from writing papers with him, and from conversations and associations through the years. Since then many young men have similarly benefited from knowing Jimmie, and their training is part of his scientific legacy, along with his writings." "I have also been present at dozens of conversations, some brief and informal, at which Savage magically would get at the true heart of a problem or its solution, and wholly change the course of a scientist's research." We may fittingly end with these personal tributes to the pre-eminent personalist of the century, and with the thought that in the end, the real game is in the game, and not in the game theory.